The Crumpet: Holy Nail Art Fail! 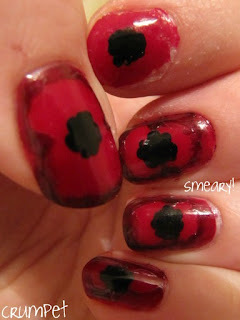 Poppies ... really ? Yesterday was 11/11/11, the day when we remember all those who have given their lives in wars and service to their country. 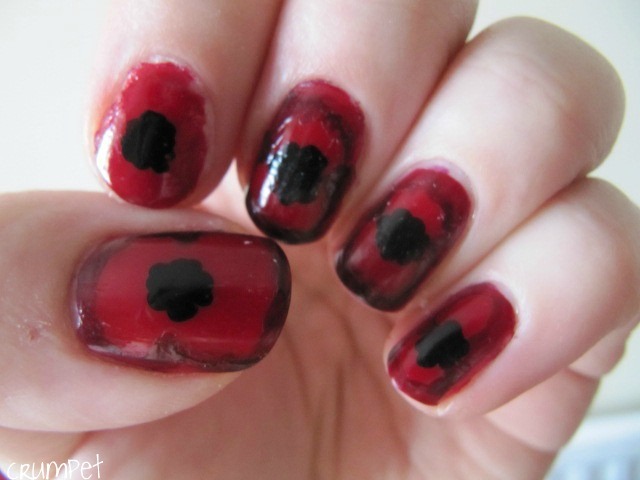 In England, we wear poppies, to commemorate the bloodbath at the Battle of the Somme in the First World War. 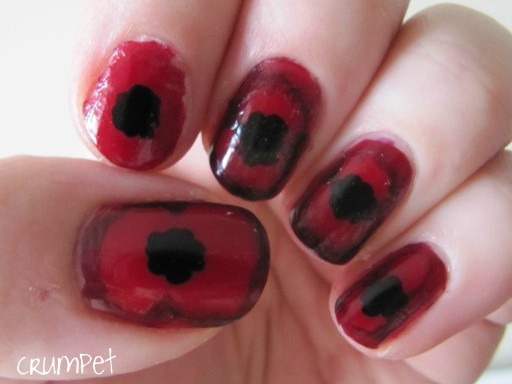 Coincidentally, poppies are my favourite flower. Sounds like a recipe for nail art heaven ? Siiiiiigh. This is a BIG Crumpet fail. BIG. So why am I posting about it ? well, it seems some of you find my disasters funny (me included) and enjoy reading about my mishaps, because quite often they are YOUR mishaps too. 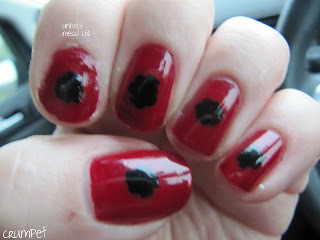 I am not a perfect swatcher like the Polish-Aholic, or a talented nail artist like Nail Nerd or Chalkboard Nails (crikey, where the *hell* do I fit in? lol) but I do love my polish. Ready for a Chronicle of a Disaster? Ok, buckle up. This started with 2 coats of Deborah Lippmann LADY IS A TRAMP, a gorgeous red, not too bright, slightly starting to turn dark. It’s lovely, and a perfect poppy colour. 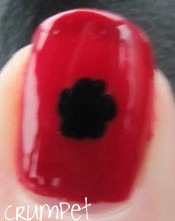 I then got a medium dotting tool and put some irregular black circles inside the poppies. Voila. So far, so good actually. This was lovely and clean in deisgn terms. ooops the traffic is no longer jammed and has started moving! 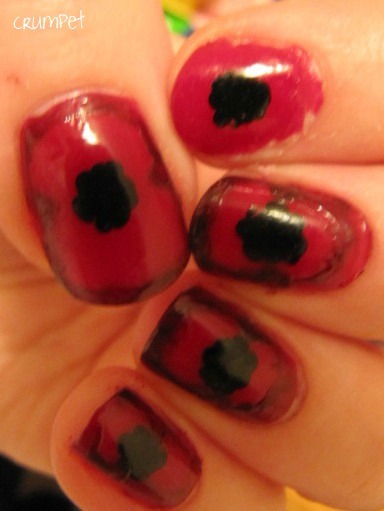 However, it bugged me all day that they didn’t REALLY look like poppies. 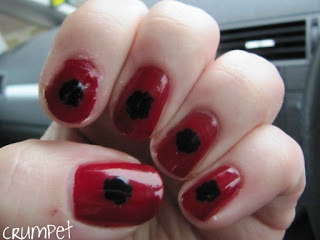 From a distance they looked like red nails with a random black splodge in the middle, so when I got home, I decided to ahem “refine” them a little. Can you see where this is going ? lol. 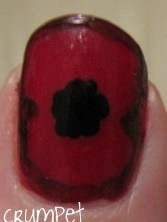 So, the goal was to make the poppies look like the ones we wear in England – basically 2 large petals. That sounds easy! Well, to be honest, I’m not so disheartened with the thumb nail, it’s pretty much how I visualised … the problems come with the other nails …. So, firstly, lets discuss Index Finger. 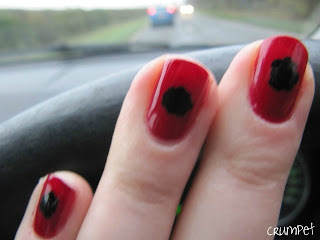 This is my nail with the annoying split in it which I am trying to grow out with silk wraps. Have I mentioned before how clumsy I am, how I have large hands, and how I am also cack-handed ? Seriously, I have NOOOOO hand eye co-ordination (ooooh that might be a good excuse for my bad nail art). So, Crumpet cuts the silk wrap to size, and smears nail glue all over nail. Crumpet puts silk down on nail. Crumpet lifts finger back up, and finds silk wrap stuck to flesh on wrong finger, as I had gotten messy with the nail glue. Siiiigh. Luckily, I am used to such botches, so I try again. This time, I get the silk wrap to stick, but not in the shape I designed it, so I am left with a big sticky uppy bit which I flatten down with a blob of glue, meaning to trim it to fit once the glue is dry. Unfortunnnnnnnnately, the nail glue dribbles outside the nail bed, onto the skin and I now have a lovely moat of silk wrap all around that side of the nail. Siiiigh. Seriously, just Don’t Look at the index finger lol. So then to the other nails. And this is where I always seem to struggle. Thumb always comes out fine. Other nails? Disaster! I don’t know if it because they are narrower, or because I get bored, but holy crap, What A Mess !! Now, from a distance – say, a mile or two – they look ok, really they do. But up close ? Man alive. And here is my biiiiiiiig problem. I can NEVER get nail art brushes to work for me. I can never get clean lines with them, or move the polish around. A dotting tool works fine for me, but not the brush. So this is an appeal – in exchange for allowing you all to laugh at me, if anyone has any tips at all on how to get lovely coverage with a nail art brush and not the streaky uneven mis-directed messes currently exhibiting themselves on my nails, PLEASE let me know. I need to get better, I do, cos I have lots of ideas. 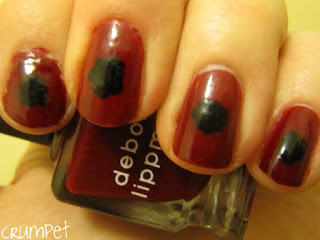 Worse, one of the frequent comments on the Giveaway was “we’d love to see more nail art”. Really ? Are you still sure about that ? Lol …. Oh man, this is going to be a long learning curve …….